Tibet Week 2015 celebrates the theme of "Exploring Compassion" through a series of traditional events and educational opportunities. The annual celebration of the culture, arts and philosophy of Tibet is set for March 23-28. 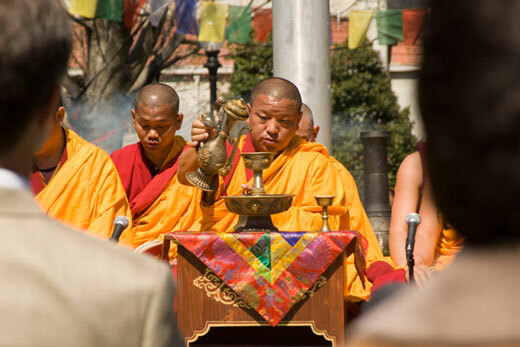 Tibet Week begins at noon Monday, March 23, with the Incense Offering and Opening Ceremony on the Quad and in the Carlos Museum Reception Hall, led by Geshe Lobsang Tenzin Negi and monks of Drepung Loseling Monastery. All events are held in the Reception Hall of the Michael C. Carlos Museum unless otherwise noted. On Tuesday, March 24, Geshe Lhakdor, director of the Library of Tibetan Works and Archives, will address how the ancient tradition of Tibetan monastics is finding new ways to interface with the modern world in the talk "A Legacy of Compassion: Why Tibetan Monastics Matter in the 21st Century." Gillian Hue, senior program coordinator for the NIH-funded Initiative for Maximizing Student Development (IMSD), and student Sonam Choephel are the respondents; Michael Romano, post-doctoral fellow in the Emory-Tibet Science Initiative, will moderate.